Ladies, I know you’re upset about the Supreme Court’s ruling in Burwell v Hobby Lobby. Heck, I can understand your anger, at least a little bit. You think we men are trying to control you and your bodies, but we’re not. Okay, we are; but it’s for your own good, I swear. Look, we all know you gals were put here as man’s helpmate; well, that, birthing babies and raising families. We just want to keep you barefoot and pregnant restore the natural order, that’s all. Some of you say “The Pill” helps moderate your “lady problems” and such. I have a problem with that idea because it’s established fact that birth control is strictly for recreational use. Of course, it’s likely I believe that because I don’t understand how it all works. But, I figure it doesn’t affect me, why clutter up my brain with such useless esoteric knowledge? Look, it’s not like Hobby Lobby isn’t willing to pay for some of your birth control; they are, just not the one that cause abortions. What is it, Plan D? G? B? Whatever. Now, the nut jobs libtards progressives will tell you there is scientific consensus on the idea that these demon pills don’t cause abortions. I’m not so sure we should believe anything those heretics people say. They use that same “scientific consensus” line as proof of evolution and the Big Bang when anyone with half a brain knows that God created the world and everything on it in 7 days around 6000 years ago. And, the Bible doesn’t make mistakes. Can “science” make the same claim? Truthfully, this wasn’t even about you as much as it was Hobby Lobby’s First Amendment right to religious freedom. 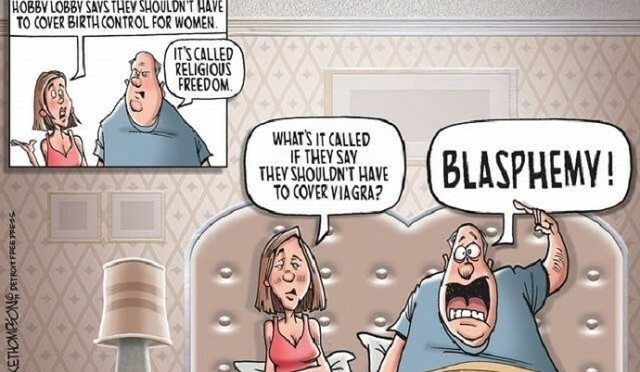 Now some folks are questioning whether a corporation’s religious beliefs should trump your “right” to birth control. The answer is, of course, yes. I know that sounds bad, but there are very good reasons why it’s true. Unfortunately, they’re complicated and you gals probably wouldn’t understand them. Just trust that we have your best interests at heart, okay? Some folks are saying this decision will come back to bite us Christians in the…, rear. Don’t worry your pretty little heads about that, the justices who were on the right side in this issued the majority opinion clearly stated that this was a narrow ruling and didn’t open the door for anything else. Now, there are a few twits pundits who say precedent doesn’t work that way, but what do they know? And, even if they do turn out to be right, it won’t matter since those other cults false religions faiths don’t count because as everyone knows, the U S of A is a Christian nation. So, to all you “ladies” who are struggling with this, I ask that you just calm down. Don’t see this as men controlling you; look at as an opportunity to leave the workplace and return to your natural state: housewife and mother. Say, when you get back where you belong to the kitchen, do you think you could make me a sandwich? All this mansplainin’ has made me hungry.